Homeowners no longer have to sacrifice fashion for functionality when it comes to flooring. With so many versatile products now on the market, you are sure to find a product that satisfies in all respects. For active households, we can suggest a stylish and durable option like tile flooring. Our store is proud to carry a wide range of tile lines, featuring impressive options like porcelain, marble, slate, and ceramic tile. Whether you are concerned about durability or are more interested in style, you can feel confident turning to us for the tile of your dreams. We offer exceptional services and exclusive selections guaranteed to make your upcoming flooring project a breeze. Investing in professional tile installation is just as important as choosing a quality tile product. This is something we recognize at our flooring business, and it is also why we offer installation services on behalf of clients. Once you’ve made a confident purchase from our store and showroom, we immediately schedule a time for our in-house installers to visit your home. Our professionals utilize trusted techniques and technology in order to flawlessly execute the tile flooring installation. We remain so confident in the work of these technicians that we back their efforts with one of the most impressive warranty systems in the industry. One such warranty is the Lifetime Installation Guarantee. Should you experience any installation-related issues over the lifetime of your floors, we provide resolutions at no charge. With our assistance you can look forward to the process of replacing your floors. Make this project easy, and even enjoyable, by turning to our team of flooring experts. As soon as you walk in the door of our store, we do everything in our power to ensure you walk away with tile that doesn’t disappoint. We take the time to understand your expectations, enabling us to recommend a type of ceramic or even porcelain tile that is sure to fit your needs in looks, performance, and price. Finding the perfect tile to enhance your unique home design and décor has never been so easy. 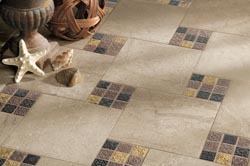 With so many appealing products to choose from at our location, you are sure to discover tile that doesn’t disappoint. Right now, slate tile is becoming increasingly popular among the homeowners in our area. Its rugged and rough appearance makes it the ideal complement to your house’s rustic interior schemes. When you’re ready to shop for tile like this, don’t hesitate to make a visit to our business. Look to our local store and showroom for tile flooring that doesn’t disappoint. Contact us by calling <PHONE> for more information about our 12 month financing plans or by filling out the contact form to become familiar with our inventory. We serve the needs of homeowners in Ocoee, Oakland, Gotha, Orlando, and Windermere, Florida, as well as the surrounding areas.